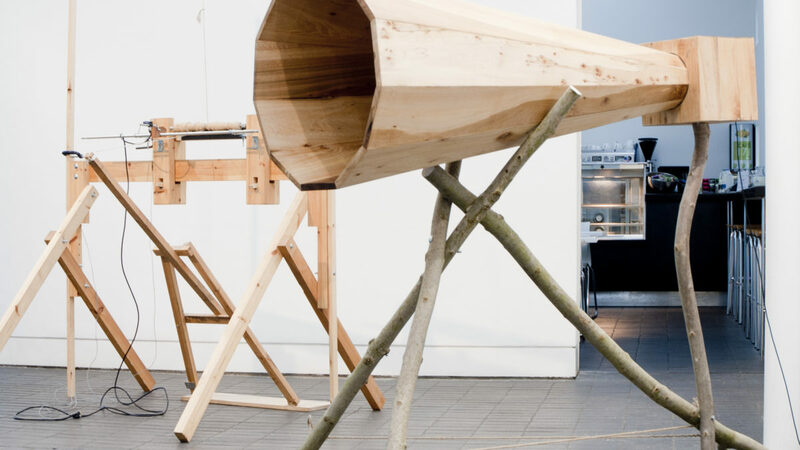 A group exhibition of work by Jonathan Anderson, Edwina fitzPatrick, Luke Jerram, Anne-Mie Melis and Owl Project, curated by Hayley Skipper and Antony Mottershead, Forestry Commission, England. TERRA explores the relationship contemporary sculpture practice shares with the environment and landscape beyond the gallery space. The strategies and processes employed by each of the artists translate information from one form of sensory experience into another. The range of practices included within the curatorial selection are an expansive definition of sculptural practice covering performative and installation based work that engages all of the senses including sound and smell. Jonathan Anderson works with coal dust and other elemental substances. His work expresses the cyclical nature of things and provides an ideal vehicle for the exploration of poetic metaphor and transformation. It talks about shutting off, making still, stepping out of sequential time and ultimately death. Edwina fitzPatrick explores living environments that involve mutability and change and reflects upon how climate change may affect this delicate balance. Her work also celebrates narratives and conversations, which are often deeply informed by the history of place. She often collaborates with experts across a range of disciplines including horticulturalists, biodiversity experts, architects, perfumers, foresters, and composers. Edwina is currently completing a PhD with Glasgow School of Art in collaboration with Grizedale Forest and developing practice-based research in relation to the development of the environmental art archive at Grizedale. Luke Jerram makes sculptures, installations, live art and gifts fusing his artistic sculptural practice with his scientific and perceptual studies. His ongoing research into perception is fueled by the fact that he is colourblind. He studies the qualities of space and perception in extreme locations, from the freezing forests of Lapland to the sand dunes of the Sahara desert allowing new ways of seeing. Anne-Mie Melis’ work explores the visual nature of plants and their role in an increasingly technological world. Combining sculpture, animation and drawing in innovative installations to ignite our senses and expose her questioning of the environment, the engineering of nature and our changing climate. The collaborative nature of Melis’s practice brings together art and science. Owl Project (Simon Blackmore, Antony Hall and Steve Symons) creates music-making instruments and machines that combine electronics and software with traditional techniques such as green woodworking and wooden water wheels.